‘Aha’ moment: There is not one single ‘aha’ moment that comes to mind when I think about my FoodCorps service at DCB, a year and a half in — what I have instead are a million tiny moments of change at work that on their own may seem inconsequential. The kindergartener who routinely finishes her plate in order to be in the “clean plate club;” the first grader who chooses a new veggie at the salad bar; the fourth grader who asks, every day, when we can go out to the garden next. If I ever feel despair over the state of our food system, or the environment my students are inheriting, or the health injustices they’re facing — I focus on these tiny rays of hope. In my service I have the responsibility and the privilege of planting seeds not just in DCB’s spectacular garden, but also in the minds and hearts of the passionate, brave, and loving kids I work with. My deep hope is they flourish into individuals who have the tools to make informed food choices and fight for a just and equitable food system. "I’m not sure I can pinpoint on exact moment that has exemplified the growing 'Farm to School' movement, but it has been amazing to see our community grow by leaps and bounds every year, as more DC students and residents become in engaged in school gardens and reaping the benefits of eating and living a healthier lifestyle. My passion over the past couple of years has been helping youth find their first jobs in the green sector- this spring we are starting an entrepreneurship program aimed helping at-risk youth find their calling through horticultural therapy and the interest has been amazing. One student took the initiative to reach out to me immediately after an information session, to learn how she could best support her vegan lifestyle- that student is now working with us part-time and helping get our rooftop garden center ready for spring. I also learned that she is an artist, and she is creating some beautiful artwork and murals for our gardens. I am enthused and motivated everyday by the gusto with which the next generation is taking up arms to create not only a just and equitable food system, but a thriving community around it." I have loved my role with FoodCorps and the opportunity to engage students with experiential learning around food. One of my first projects at Mundo Verde was to organize a Fall Garden Workday for families. My “aha” moment came during this workday, when a student who was harvesting beans exclaimed, “this is more fun than playing!” Over the past several months, I have seen students come alive and get so excited about learning when they are outside in the garden. Being able to work in the dirt with their hands engages students' bodies and minds and allows them to experience how food grows for themselves. I look forward to continuing hands-on lessons with students in the garden and watching them come to their "aha" moments. My two years of working with FoodCorps in D.C have been amazing, to say the least. I've had the pleasure of working with different students of all ages and taste buds. My 'aha' moment came at the end of last school year. Throughout the year we had tried an array of different fruits and vegetables. Most kids were hesitant to try all of these unfamiliar and different foods, but by the end of the year, they were excited to try diverse things. During our last lesson and meal together one student proudly exclaimed: "This taste better than McDonald's!" It was then I realized food education and access is a marathon, not a sprint. With constant support and resources, we can transform students thinking about food. With programs like DC Greens School Garden Market, students are not only able to grow and try fruits and vegetables in school, but they are then able to buy and take these foods home to create a healthy meal. Cultivating a school garden is a very special thing. Students, teachers, administrators, and parents alike are brought together to reap the fruits of their labor, or bliss of what their child or student was able to grow and harvest. While implementing an 8-week nutrition intervention with 90 fourth grade students in Whittier, California the students and I were able to transition an eye sore into a green space for the school community. While this intervention got many of students to think about the food growth process, nutrition, and connected them and their families to farmers in the region, I wish I could have given the students so much more. As the Education Coordinator with DC Greens, I've been able to champion the School Garden Market program logistics with SGM Managers and the Common Market to ensure students can deepen their connection to healthy food via a student run farmers' market. Interacting with SGM managers and students during site visits to SGM's and school cafeterias across the district has enabled me to continue the work I discovered in California, and support change makers of all ages. I'm thrilled this Fall 2017 SGM season is off to a great start, and that students across the district are gaining hands on experiences growing, procuring, and selling healthy food to their school communities. While I was working for FoodCorps, I had the opportunity to work directly in schools with students of all ages to improve the culture of health through food. We cooked, tasted and tried new things in the classroom, garden and cafeteria. The more we engaged with new foods, the more student excitement grew to keep trying new things! I quickly learned that my students were curious, open and excited about foods they had never tasted before. From hummus and green smoothies, to raw lunchbox peppers and sungold tomatoes, the students were excited about trying the things they grew and made. Many students wanted to share this excitement with their families and bring recipes home to make again. However, I soon realized that finding the fresh, tasty vegetables, like the ones growing in our school garden was much more difficult in our surrounding community. Eating local food was a novelty and only available to certain parts of the community I was a part of. This “aha” moment, led me to my work with The Common Market. At the Common Market, we believe that fresh, local, delicious food should be readily available to all people, regardless of zip code. We work with institutions like public schools, universities, hospitals, restaurants and retailers to get more local on their menu and help make the local choice the easy choice for everyone. I am so excited to be able to supply DC Greens’ School Garden Markets with fresh produce from our sustainable farm partners across the Mid-Atlantic so that students and their families across DC can continue to cook and eat delicious, fresh meals together. Roxanne Bentley is the Enrichment Resource Teacher and School Garden Manager at Murch Elementary. In her role, she enriches students knowledge of Farm to School, and provides an opportunity for students to strengthen their entrepreneurial skills. Jon Wirth is the School Garden Coordinator for Education Coordinator and School Garden Manager at DC Prep’s Elementary Campuses in Edgewood, Benning, and Anacostia in Washington, DC. In his role he facilitates experiential learning with a core focus on food, and produce procurement for DC Prep’s SGM program. Victoria Mirowski is the Education Coordinator and School Garden Manager at Cultivate the City in Washington, DC. In her role, she facilitates the produce procurement and distribution for CTC run CSA programs across the city. In our garden, we strive to educate beyond the plants and produce, to cultivate an appreciation for the garden’s entire ecosystem. From the earthworms, to the bees, to the pests and diseases each component is playing a part. Thus, the teaching opportunities are endless, and with classes of eager students, I can say with confidence that I never have just one ‘aha’ moment. They happen often and my students are sometimes the best teachers. Throughout the year, I encourage my students to watch the garden with mindfulness. A garden is a place full of smells, textures, and tastes, which can overwhelm our sense. Some of the most important moments come when we stop, cultivate presence of mind, and simply observe-what has changed, what is growing, what has died, and why? Recently during our garden time, a student led me to a peach tree to show me its leaves, certain that something was wrong. Sure enough, that student had discovered, before I had, that the tree was suffering from Leaf Curl, a disease caused by the fungus Taphrina deformans. This moment- where a student was able to observe their surroundings, pull from past observations, and draw their own conclusion- is magical. Teaching children about fresh fruits and vegetables is central to cultivating healthier lifestyles. And teaching them to observe and appreciate all of the subtle details and interactions within the garden ecosystem makes them feel more invested and involved in the process. 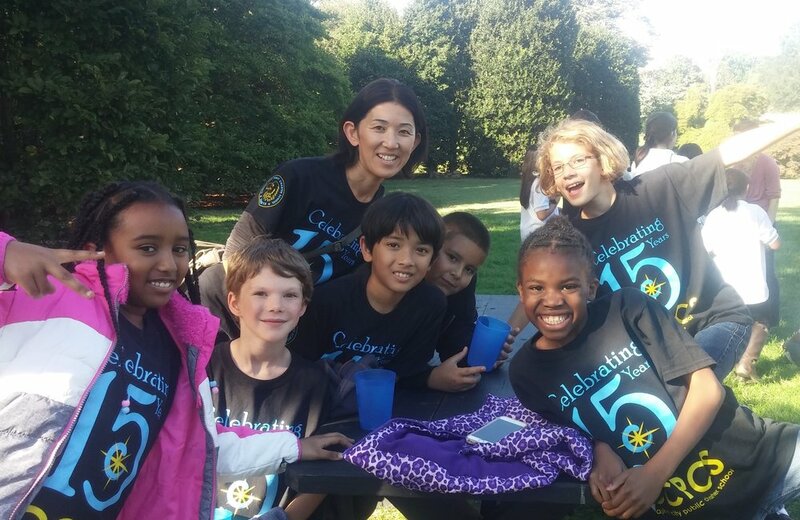 I have ‘aha’ moments daily, and if they never stop….neither will I.
Ryoko Yamamoto is the Garden Coordinator at Capital City PCS in Washington, DC. In her role, she connects students to their local food system with environmental and garden education. In our garden, we grow abundance of vegetables and herbs. Herbs are widely used for cooking and craft, come in many varieties, and provide students with constant discovery of something new. Every week in July I teach lessons with new garden-based recipes for our elementary students. To begin the lesson, I asked my 4th graders a common question: “What’s your favorite vegetable or fruit?” Students called out, “Strawberries!” “Orange tomatoes!” “Cucumbers!” Then one student said, “I like the one with red flower that you can drink the nectar from”. Among all garden foods he tried past years, he chose Bee Balm, a delicate red flower and an incredibly important pollinator, attracting bees and butterflies which then pollinate the other herbs and flowers in the garden. His answer really struck me because in years past, I spent time teaching this same group of students about how honeybees collect nectar from flowers and had students mimic their behavior. They took turns sampling small amounts of the sweet and subtle nectar from the Bee Balm and this boy had remembered the lesson. Moments like watching students use all their senses to taste and experience unfamiliar but exciting new flavors is deeply inspiring to me. When we are introduced new flavors from real foods at a young age, we create positive associations with trying new things that lasts a lifetime. Seasonality and trying these foods amongst friends in a safe and celebrated space such as a schools garden is also important. Tasting foods is an all encompassing experience and herbs (and flowers!) are a great way to expose students to new flavors. Patrick McDermott is the DC Program Manager for Common Threads. In his role, he partners with schools and community-based organizations in underserved areas across the District to teach kids how to cook and eat healthy meals. Before I came to Common Threads, I worked in a few different restaurant kitchens throughout DC, and one of the biggest things I learned was that fresh ingredients are essential to putting out the best possible product. We worked directly with the farmers and producers to get fresh ingredients whenever possible because customers demand the highest quality. When I started teaching nutrition in schools as a Chef Instructor for Common Threads, I saw that schools haven’t made that same connection yet for the food they serve their students. It just seemed like common sense to me that in order to help children be the best version of themselves, then you need to make sure you feed them the best food we can offer them. My biggest garden market 'aha' moment was turning our market to a CSA model. This really increased our sales as staff throughout the building placed orders on a weekly basis. The CSA model really turned our market into more of a business and provided youth a wider range of jobs and tasks. This allowed for students to use their strengths, preferences, and interests to contribute to the market. My “Aha” is a reflective moment I had one fall day at the Janney School Garden Market. As I watched a 2nd grader pull out her wallet and carefully select a bag of veggies, all the while telling her mom which ones she had grown in her class garden, I realized the impact our garden program has on our over 700 students and their families. Thinking about how even our youngest students learn that their actions have a global impact as they raise, tag and release monarchs and exchange letters with a partner school in Mexico to learn when their butterflies have safely arrived. How our first graders have the opportunity to raise chickens and take eggs home to their family; all the while learning about life cycles, caring for animals, and where their breakfast came from. How our 2nd graders learn about the importance of bees as pollinators as they plant pollinator gardens, observe bees in our hives, and harvest honey to take home. How every one of our students has the chance to enjoy preparing and eating fruits and veggies that they grew right in their own garden. Our weekly market provides a time for me to reflect on the impacts of these experiences. As I watch students shop for a healthy snack or for veggies for the evening meal, enjoy tastings, prepare an in-season recipe, or just walk through the gardens to see what is growing, I feel truly heartened. At these times I have faith that we are cultivating a generation of students who know the joys of interacting with nature, are educated about healthy eating, and will take an active role in caring for our environment. My Farm to School ‘aha’ moment is probably when I was serving as a Peace Corps Volunteer in Vanuatu. I was placed at a rural boarding school where students were responsible for growing and cooking their own food. Each morning groups of students would bake bread, bring back the day’s produce from the garden, and prepare it for all of the students. Meal time was always about sharing and connecting with each other before heading back to class. This vision of school food is far from what we experience in DC today, but I am excited to see many schools make meaningful connections between the school garden and school food. My farm to school ‘aha’ moment took place several years ago while I was working in upstate New York at a non-secure juvenile detention facility. I was teaching for their summer program as well as working as an enrichment coordinator, connecting local organizations and opportunities for growth to the young men who lived at the facility. During the summer we were able to get approval to travel to a nearby college one day a week and work with them on their newly established farm. For all of my students, most of whom came from New York City, this was a new experience. This was also my first time stepping onto a farm. We were all blown away, finding joy in picking spicy radishes from the earth, stepping close to their beehives and bringing back yellow watermelon for everyone to enjoy. It was during those afternoons that I saw students who struggled to stay focused and engaged in the classroom excited by everything around them. It was in those moments that I began to see the potential of nature as a classroom. As 11th grade students prepared for this year's Food Justice Youth Summit, I got to join in their research about school lunches in DC's charter schools. It was incredible to learn from our own food service manager about the joys and struggles of feeding healthy, sustainable and appealing food to our student body. We also got to tour a series of amazing school kitchens around the city to learn about best practices and seek inspiration. My students and I were floored by how complex the school food system is and how hard food service managers and cafeteria staff have to work in order to feed students every day. Students and other stakeholders have to understand these systems so they can advocate for meaningful change. In DC, we're lucky to have organizations like DC Greens and initiatives like the Farm to School Network and the School Food Advisory Board to help move these causes forward. My first couple of months as a FoodCorps service member, I was enthusiastic, passionate, and a had head full of knowledge from our beginning of year training. Who was better for the role of connecting kids to healthy food? When I started hosting monthly seasonal cafeteria taste tests, I started off with the safest of vegetables: cooked carrots. Yet students and staff alike approached my table with apprehension and mistrust — “Why are you here?” “What are you promoting?” “Is it healthy?” "Is it good?" One by one, they filed by the table, some quickly tasting the food and casting their votes and some deciding to forego trying it. Even with the familiarity of carrots on my side, the “loved it” bucket had very few coins compared to the politely-stated “tried it” jug. Although slightly saddened and fairly overwhelmed (how was I suppose connect kids to healthy food if they wouldn't try it? ), I realized that I could not do this alone. I started conversations with staff members, with parents, with students and slowly found my school food and garden champions. I found people to learn from, to grow with, and to support along the way. Together, we cultivated opportunities for students and families to grow their own food, learn where it comes from, and choose to eat it every day. Now in my role coordinating FoodCorps programming and supporting service members placed throughout the District and northern Virginia, my Farm to School “aha” moment (read: life lesson) has stuck with me -- we can't do it alone and there is no use pretending that we can. FoodCorps leverages partnerships with schools and community-based nonprofits to support our service on the ground and together with our partners, our friends, and our Farm to School family, we can ensure our students receive the nutrition education and good food they deserve. Every Wednesday we host our school Garden Market with Common Market fresh produce. The “aha” moment came this school year when thinking of new ways to promote a healthy, balanced lifestyle. Our FoodCorps’ Service Member and I decided to feature a fresh prepared, healthy after-school snack to showcase a variety of vegetables and fruits. From salads to applesauce, students, parents, and staff love our fresh, simple snacks prepared each week. We even include a recipe card! As a teacher, after working long and tedious weeks, making sure I get early to the Farmers Market every Saturday to be there and assist people with interpreting may seem something tiring, but just my first day when someone came to me and hugged me and told me how grateful she was for having someone who understands her and could make sure they have the same opportunity to access food no matter they origin or nationality, that made my day and showed me how big a simple and easy action can be for somebody else. From that moment, I committed myself to help and serve my Spanish speaking community as best I can in every way I can possibly do. When I first started working in the elementary school garden I had hoped to inspire youth with my years of enjoyment working in the garden but, to my surprise, the tables were turned and I found myself inspired by the natural wonder of my students. Seeing their thirst for knowledge and hands-on contact with nature confirmed for me that this is the absolute perfect place to begin an environmental education and I have been hooked as their guide ever since. I am an avid gardener in my personal life, and love sharing this passion with others. When I first started at Tubman 4 years ago, I would often bring in vegetables that I had grown or processed in my garden, like candied jalapenos, to share with my colleagues. They always seemed amazed that I had grown the vegetables myself--and it struck me that if they were so interested, maybe the kids were too. What began as an idea to start a small teaching garden has turned into a beautiful outdoor classroom (thanks to the support of the DC Urban gardening and Tubman communities! ), complete with a full garden, where we teach kids how to water, feed and plant vegetables and flowers; a seasonal farmer’s market, where the kids learn about running a business; and even a mobile chicken coop, with four chickens, where students and teachers alike learn about caring for farm animals (and take home fresh eggs daily!). Each of these programs gives those students who aren’t excited about classroom learning the opportunity to ‘learn-by-doing’ -- and I’m thrilled to see their growing excitement, interest, and engagement in what I believe is an important addition to their overall learning and growth. Judith grew up on the green lush island of Trinidad. Some of her earliest and most treasured memories involves her picking fresh food from her backyard. As a child she followed the footsteps of her elders, putting the freshly cut orange peel in the sun to dry for tea, throwing away food waste around the mound of the mango tree, picking a large aloe vera fleshy leaf to make a morning drink or using old bed sheets as dust towels. As an adult and a mother to a beautiful four year old, Judith realized she was taught these core principles of healthy eating, composting, using organic produce, and repurposing household items from a very early age. She wants to give her young daughter similar experiential lessons, but living in an urban city poses some challenges, as eating healthy and organic foods can be expensive and the opportunity to pick fresh fruit is limited. When Judith’s daughter started pre-kindergarten 3 in 2017, she realized that the majority of students at Cleveland Elementary may not have had much exposure to organic fruits or vegetables and simple using available to plant food. She decided to take lead and chart a mission for Cleveland Elementary to have school garden program and partner with environmental education organizations. Although I’ve always had a strong interest in food and worked with kids before, Farm to School was a whole new world to me. My ‘aha’ moment came unexpectedly one afternoon when I saw how the garden became a safe space for a student. One day, I was walking past the main office on my way to the garden and heard screaming. There was a student who had been going through a particularly hard time outside of school and was dealing with a lot. She was having a bad headache and was waiting to be picked up. When I saw her in distress, I asked if she wanted to help me out in the garden, hoping it would be calming. The student looked up and saw a variety of seed packets in front of her and nodded her head. The next few minutes were spent looking through the packets to pick which seeds we wanted to plant together. Surprisingly, the student picked radishes, and was fascinated that they could be ready in as little as 28 days! As we walked outside and into the garden, there was already a noticeable difference in her- she was observant of the trees and plants around her, and more at ease. We picked a garden bed, spaced out rows for our seeds, and got to planting. The smile started to form on the student’s face when she had her hands in the soil and placed each of the seeds in their rows. It was astonishing to see this child go from screaming and in pain to smiling and relaxed, and all it took was going outside and ‘playing in the dirt’ like any kid should be able to do. That moment, it was clear that bringing the growing experience to students can help them feel empowered about knowing where their food comes from, but it can also be therapeutic for kids that have to grow up too early. Daniel Barrera Ortega is the current FoodCorps AmeriCorps service member at DC Bilingual Public Charter. This Colombian citizen transplanted to the district by way of South Florida never imagined he would be teaching gardening and nutrition to elementary school students. He graduated from the University of Florida with a degree in Plant Genetics & Breeding and originally thought he would become an academic researcher. However, after taking a class on UF local food systems and volunteering with Working Food, a Gainesville-based food justice non-profit, his sights shifted towards educating and empowering communities to create more sustainable local food systems. When he’s not planning and preparing for lessons, you can find him playing video games at home, collecting Magic the Gathering cards, or catching an Improv show somewhere in the district. My ‘aha’ moment happened during a quarter-life crisis some months before graduating college. I realized that while I could tell people many fun facts about genetics and plant disease, I didn’t know how to grow food for myself (much less for someone else as a job). This led me to become involved with Working Food and their youth outreach program. I was able to talk to students about the many plant parts we consume, where food can come from, and the critters that make it all possible; teaching about what vegetables look like made the students interested to eat more of them. I eventually joined FoodCorps and met my current mentor, Lola Bloom, both of which further solidified my future direction. Empowering youth with food system education is key to breaking cycles of health disparities, unsustainability, and lack of access which now stands. While I’m still trying to pin-point what my exact role is within that statement, I’m glad to know that is my bottom line!